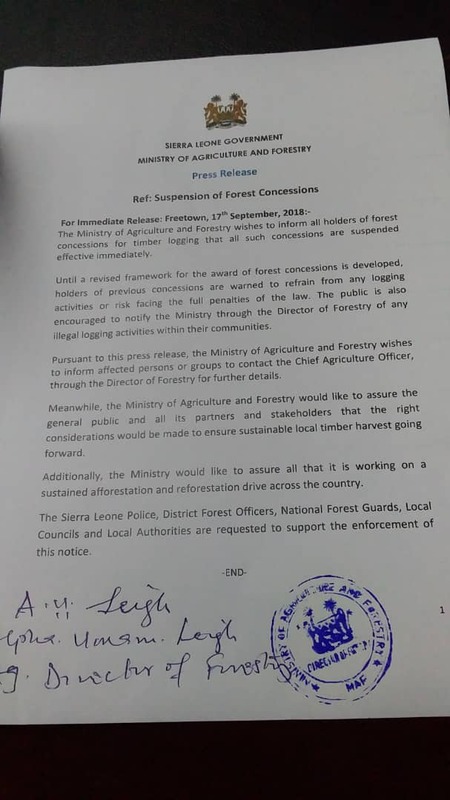 Sierra Leone’s Ministry of Agriculture and Forestry issued a press release on 17 September announcing the immediate suspension of all forest logging concessions until such time as a ‘revised framework for the award of forest concessions’ has been developed. The Ministry cautioned that any continued logging activity could result in legal penalties, and requested that police, district forest officers, local authorities and national forest guards assist with enforcement. The general public were also encouraged to report any illegal logging to the Director of Forestry.